When projects come to an end, teachers want to tell success stories, creating a narrative marked by student work that is polished and significant, pointing to examples of what students accomplished, and illustrating the importance and scope of what we are guiding them through in our classrooms. In the case of the Responsible Change Project at my school this year, such a highlight reel would center around this group’s presentation on pet safety at a local elementary school and this group’s community cookout. These projects made a strong claim for students doing advocacy work in the classroom. Focusing solely on success stories, though, misrepresents the experiences of many other groups of students—those who struggled to ever find direction, work through all the problems they encountered, or couldn’t quite pull off what they had planned. Retelling a narrative through these less-than-heroic experiences, which we often prefer to sweep under the rug when writing publicly, casts a different light on what teaching and learning means. It shows real learning as messy, non-linear, and uncomfortable—for both students and the teachers who are figuring it all out alongside of them. For teachers, particularly when leading student-driven projects, this learning feels like being stuck. The project has been planned and the work of it is underway, and then, the energy and imaginations of middle school children all thinking towards different directions is just too much. Openness and collaboration, ownership and problem solving, the traits that make such projects meaningful, invite uncertainty and confusion. It’s not clear what the end looks like because the students are in charge of figuring that out. You, the teacher, just know you are far from it and that it’s too late to turn back. And, that you are overwhelmed. My coworker, Breena, and I found ourselves at this place during the semester-long assignment we called The Responsible Change Project. 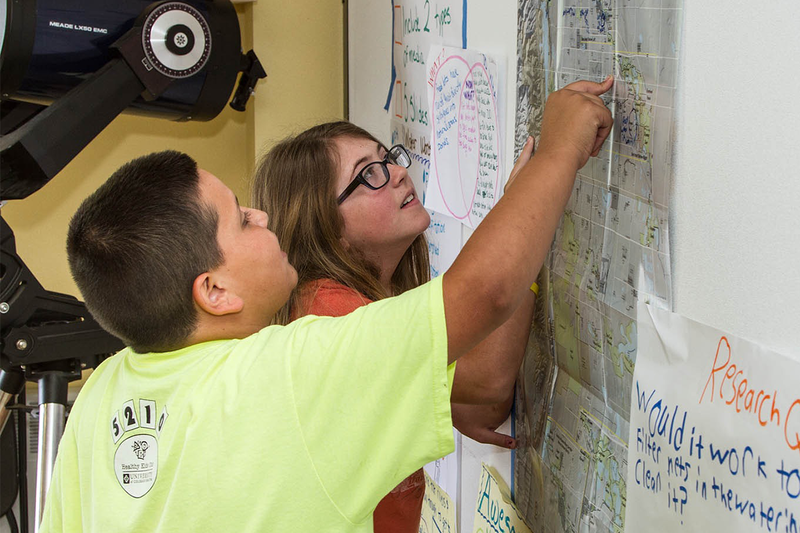 The project asked 8th graders to identify, research, and write about an issue important in the community, then develop a plan to enact positive change in connection to that issue. Students would carry out their plans, then write, rehearse, and deliver a TED-style talk to their classmates that was informative, argued for and documented the action they took, and shared what they had learned in the process. It’s an exciting idea for a school project. But that excitement quickly faded about a day into the part where students do the work of enacting their plans for creating change. Many students didn’t know where to start. Others started out with a full head of steam, but quickly became deflated when they realized what they wanted to do wasn’t going to work as they envisioned. There was so much happening in the classroom at once—plans being started, abandoned, revised—it was impossible to really get a feel for any sense of direction. No one had a frame of reference for the work we were doing. This was the students’ first experience with this sort of civic engagement in school. And on this scale, it was ours too. Our students felt lost, and so did we. It’s funny how the place where you feel the most stuck is also the place just before something great happens. After days of stuckness, of failed starts and thinking teenagers through implausible ideas for action projects, many students began to feel direction—the movement from abstract idea to real possibility. In each of our separate classrooms we saw the same thing happen. The ball started rolling and gained real momentum. Breena and I talked excitedly during our planning period, concluding we were glad we stuck it out. This civic action piece was what mattered, and it was going to be the piece that enabled the research, the argument, the speech pieces to also matter. We began to recognize that real learning was messy and we needed to do a better job embracing it—to realize that getting our students to this place was a good thing because this is exactly where they were doing the hard work of constructing meaning and ownership. Breena and I began making time in the class for students to write about and talk about their frustrations and how they were working through them. We wanted students to see that they were not alone in their struggles, that through each revision a step was taken, even if it didn’t feel like it was the direction they wanted. Tralyn and Addie’s story provides a powerful example. These two noticed that race was a particularly divisive subject this year—both in their own lives and in the community. Through their research and writing, they noted how the demographics of the country are changing and concluded that because our country is growing more diverse, not less, it is particularly important for youth to learn tolerance and sensitivity. They wanted to invite the community into a dialogue about race that would lead all involved to a deeper understanding of this complex issue that shapes our identity and interactions with others. Tralyn and Addie had the idea to start a diversity club. They made a presentation intended to promote the club, start conversations, and break down walls…then they ran into one. Turns out, they found, many administrators and teachers aren’t comfortable with the idea of two students bringing a conversation around race into their schools and classrooms. Eventually, they did find a teacher who allowed them to speak to their class, but the experience and frustration that came from trying to address this real-world issue in the real world was eye-opening for them. In the final piece of the project, where students give a talk about what they did and what they learned, Addie and Tralyn reflected on the ups and downs they experienced, what they learned in the process, and the newfound sense of agency they gained through the process. The real world is far more complicated than the oversimplified sound bites and headlines we encounter each day. In the classroom it’s important to draw out subject matters, topics, and aspirations in order to support students in inquiring more deeply. Inviting students to take a step further, to take their understanding and ideas out into the world, was both the most stressful and most important part of this project. When they made this move, they, and we, had the opportunity to shift from seeing an important topic not in terms of pro and con, but as a complex conversation among a myriad of perspectives. When students put themselves into the middle of this conversation, where they struggled to both recognize and understand the different and sometimes conflicting voices, they were able to carve out a place for themselves within it.